Nothing defines a summer better than a great road trip. But even if you can’t take the time to drive coast to coast, what about just Lake Michigan’s coast? Whether you’re a trail-running maniac or just like to stretch out on a picnic blanket, the road to Saugatuck is perfect for everyone. With a bevy of beautiful spots along the way, we’ve picked a few that should offer maximum fun and minimal worry. Pack the cooler, pick out the playlist, and hop in the car. We’re heading ‘round the bend to enjoy a day in three states. 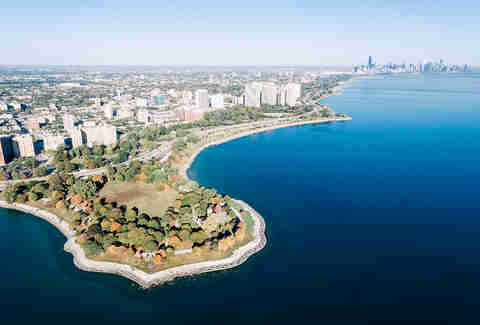 If you need to burn off a little energy before hopping on the highway, Promontory Point Park is a great place to start your trip. 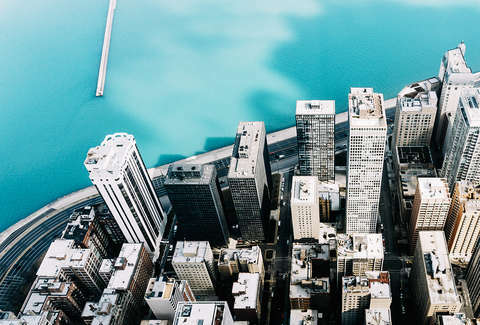 Get in a stretch, take a walk to curb cabin fever, or even watch a sunrise to feel right with the world before you go see the sights of the day. The park’s design -- notably including the “council ring” fire pits that stand to this day -- are from the mind of Daniel Burnham, aka the creative force behind Chicago’s World Columbian Exposition in 1893. They are the only public fire pits allowed in the city -- and make for a great breakfast picnic spot. 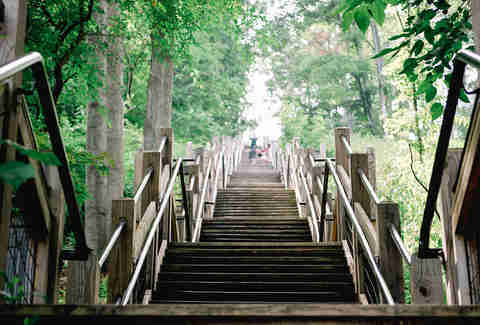 This garden is actually a 105-acre valley teeming with forests, curated gardens, rivers, and wildlife. The natural wonderland has undergone recent renovations to restore plants and trails to peak condition, so even if you’ve visited the area previously, it’s certainly worth a stop now. You might encounter other people -- but you’re more likely to encounter turkeys, turtles, and song birds amidst the lush greenery. 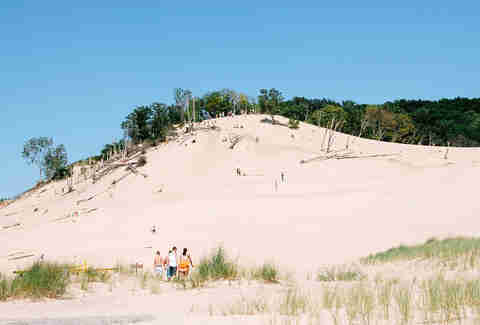 You have your choice of dunes along the south Michigan shore, but few have the sheer beauty to match Warren Dunes. 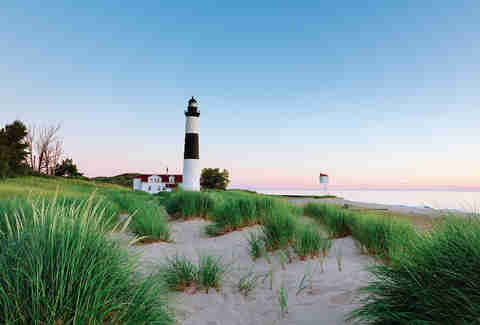 With six miles of trails, a 260-foot dune peak offering a sprawling view of the coast, and numerous campsites, there’s plenty of room to do your thing. If you’re feeling active, forget snow and try sandboarding instead (local shops can get you set up with gear); bring a metal detector and see what treasures can be found; or just lean back against a dune and enjoy the peace and quiet. At the turn of the century, Silver Beach Amusement Park was a full-scale amusement park on the Michigan Shore. Featuring roller coasters, dance & concert halls, and tugboat service to Chicago, it was a crown jewel of the southern Michigan shore. After closing in the ‘70s, parts of the park were sold off. 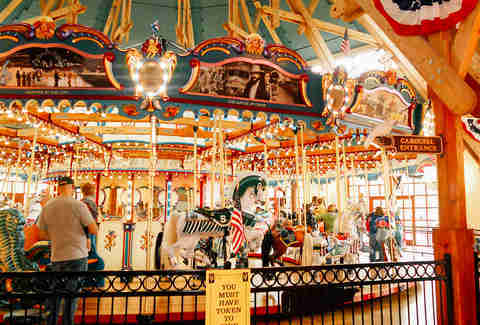 But in 2010, a new carousel was built and painted in the traditional fashion. Hand-carved and hand-painted, made without nails in the traditional style, the Silver Beach Carousel is a loving tribute to history that you can ride today. Michigan’s official state stone is the Petoskey Stone, a colonial coral that is native to the area. The patchwork exterior left by the corals makes for a gorgeously polished rock, and a one-of-a-kind souvenir. Of course, there’s no one single place to find your own stone -- the more popular an area is for stones, the less there are. So take a stroll off the beaten path and discover some spots in unincorporated Lake Michigan Beach -- even if you don’t find a stone, you’ll have a little adventure along the way. It’s not the longest trail in the world, but a quick one-mile hike will wake those legs up and knock out some post-car cardio. After taking in the views, reward yourself with a trip down to the water at Oval Beach. As a bonus, take the chain ferry over: The only ferry of its kind in the country, a crank and chain literally pull the boat along. If you sweet talk the operator, they might even let you crank it a few times yourself. 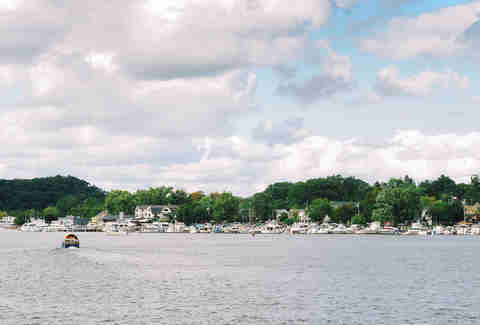 Saugatuck itself is exactly the kind of city you want at the end of a trip. Picturesque storefronts offer just about anything: local oddities, mom-and-pop restaurants, galleries teeming with local artists, even some fudge and ice cream if you’re feeling decadent. Peep some wild art pieces, have a drink and a fish sandwich, and snag house-made ice cream to pair with the sunset. After a long day of adventure, this city is tailor-made for kicking back and reflecting on a great trip.